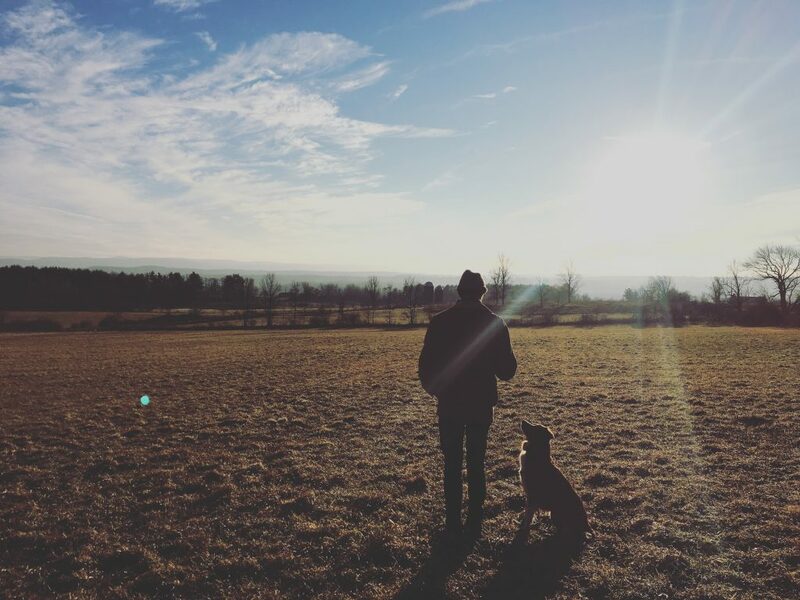 Meg shot this photo of Kit and I at the highest point at the back of the farm. In a few months this will be covered in waist-high hay ready for cutting and baling, put up for storage for the next winter. For now it’s covered in snow and too cold to trek up there, but soon. There are other, dumber, outcomes for some of the sites that promised to help us share, connect, and make sense of the cybersprawl of the “old web.” The shims that sat in between original content authors and the social networking we craved in the last decade, notably Google Reader, died a merciless death when it was spun it down in their push for Google+ adoption, arguably killing RSS with it (incidentally the same drive that killed their chat products after crushing all their competitors). 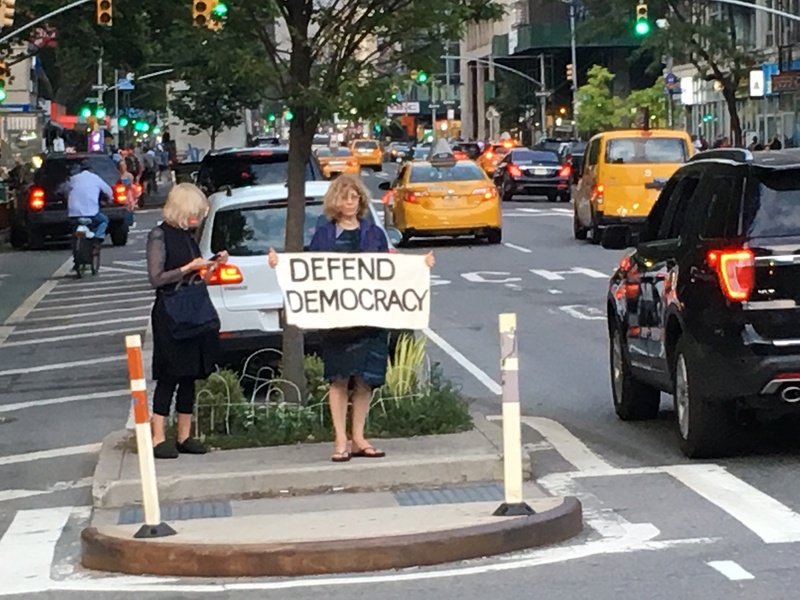 What can we do but resent our overlords and go along with their misdeeds and mismanagement wherever they may bring us, at least until they decide they are done with us and our free content submissions. As Flickr’s new owners start the process of deleting photos from accounts with too many uploads this week; as Zuck announces the melding of iInstagram, Whatsapp, and Facebook is in progress; as the platform where I blogged for the better part of a decade slides further into decay on its new Russian servers (evidently a move made partly to silence political dissidents); it becomes increasingly clear that we need to start owning our content again, and controlling our own outcomes on the net again. This means hosting our own photo galleries, blogs, fansites. Using Greg Stoll’s LJ to WordPress backup and conversion scripts I was able to dump about 650 posts and 6,000 comments into my own database, most of which remain protected for my own sanity, and yours. I’m experimenting with photo galleries in Lychee and have a small demo set up, and hope to find a way to populate it with my exported Flickr data. I’m putting a marker in the ground now to mark my prediction that these cycles will go around again and allow Slack, which is working on killing IRC, to die; Github, Reddit, all will pivot or turn down in favor or something more profitable or more creepy. One of the most challenging things I’ve been facing lately at my job is keeping up with the constantly changing and intractable product lines from Microsoft. I used to have a pretty solid grasp of feature differentiation between different versions of Windows, Office, and Server. It was all relatively consistent and available in my brain for recall. If you needed to know the basic differences between Windows Server editions, or whether Microsoft Project ships with Office 2003 Standard, or whether you need an Exchange Standard User CAL to connect an Outlook client running on Windows XP to an Exchange 2007 Standard server, I knew it. Granted the CAL requirements have always been a bit tricky, but you could figure it out. There’s a comment on the orange site from last year that I think about regularly from user basch, which scratches the surface on what’s bothering me so much. that is just a microcosm of how bad the situation is. I dont think microsoft fully understands how impossible it is to have a conversation with a lay person using microsofts correct terms. “no not skype, what you want is skype for business (a completely different unrelated product), then you want to access a folder in your microsoft office 365 group team site document library (no not teams, thats different) through the onedrive client, unless in this case you want to use the sharepoint app, err no the onedrive app, err no the OUTLOOK GROUPS, no not the outlook app, the outlook groups app (not office groups??? why????) app because the sharepoint AND onedrive app dont have that feature. You can access your group team site onedrive files from sharepoint, or outlook groups, or onedrive, but if you use the teams app you can only see the files stored in channels, which are the same as folders in your onedrive/sharepointteamsitedocumentlibrary except they are also chat rooms in teams. If you want to scan something you need officelens or onedrive, but not sharepoint or outlook groups because they dont have a scan button nor teams, because that cant upload to groups/channels/subfoldersinteamsitedocumentlibraries, so you need onedrive which has a scan button. once you open onedrive (ios) you need to click sites to get to groups, because groups are in the sites tab, even though no other onedrive interface uses the sites nomenclature, nor is sites often used sans teams. then click the group name, then click documents (because thats the only option unless you make other document libraries. if you make non shared20%documents libraries, they are inaccessable from some clients such as OWA/attachgroupfiles. so dont ever ever make them, but you will still have to click documents ever time you click the group. every time. but if you want to make another document library to partition some large files into a different document library, to prevent accident giant syncs of data, you will need to click sync again. for every document library. on every persons computer.) If someone scans something to the root of the shared20%documents folder, its inaccessable from teams because it didnt make it to a channel. And if they made a different document library, its roulette whether or not varous clients can see it or if they just autoassume shared20%documents. Oh it looks like you did all this is in your microsoft account not your office account, now you have to start over and cant move your data automatically. Yes Im sorry that onedrive personal is different from onedrive corporate which is different from a (onedrive) office 365 groupteamsitedocumentlibrary…. … here let me teach you the EASY WAY to do this. MEMORIZE tenent.sharepoint.com/sites/groupname/Shared%20Documents, and just type that right into the address bar, its much faster to MEMORIZE that string than it is to navigate the user interface. i promise you should memorize it to save time. no really im not kidding, i emplore you to memorize the url structure instead of learning the interface. fine, we can continue, lets walk through all the clicks one more time.then onenote gets involved in the mix, which gets stored in onedrive. but the surface pen can only call the onedrive that accesses onedrive personal (msa) not onedrive individual corporate, because there are two onenotes, one built into windows one into office. the pen eraser can not be reprogrammed to use the PAID FOR CORPORATE onenote, just the free app. so never click the button on the only peripheral of the three thousand dollar computer you just bought, because it will lead you somewhere you dont want to go. so now onenotes are stored in the wrong onedrive. also for some reason your computer still has the onedrive for business client, formerly, sharepoint sync, formerly groove (acquired from ray ozzie who also tortured you introducing Lotus Notes to the world, back in the day) which is depricated, lets update you to onedrive, formerly live mesh, but now the correct client to use to access your aad onedrive for business. yes im sorry, one drive for business is no longer developed but you use onedrive not for business to access your onedrive for business which is different from your personal onedrive, and also different from groups. yes you could use the share feature to share documents in your individual (corporate not personal) onedrive with others, but the more correct way to sustainablty collaborate is by using gropu onedrives. and yes, you still have to click sync for each group/document library again on your second third and fourth computer, because sync settings cant be stored in the cloud or pushed to other users. if you want to mount your group/onedrive/sharepointteamsitedocumentlibrary as a drive letter without caching and syncing it we need to install a third party zeedrive service, because windows cant remount sharepoint drive letters on reboot well. and microsoft wonders why people prefer dropbox/box…. ZDnet says “Don’t let the alphabet soup of acronyms here intimidate you. E3, E5, A1, K1, etc. are all plan designations carried over primarily from Office 365.” oh good, we all had a solid grasp on what they meant there so no worries. It all makes me think of that classic Bill Gates email rant from 2003 about the hassle of installing Windows Movie Maker. He knew it then, that something is seriously wrong with the branding and product lines of Windows. I resent that I have to keep up with Microsoft’s whims and continue to push and support their absolutely asinine products. I typically go onsite for switch software updates. They’re just about the only thing that I don’t have a good failback mechanism for in most of the networking stacks that I support. If a host server update fails, I can reset it through iLO or iDRAC. If a firewall update fails, I mostly have High Availability configurations so a single failure won’t ruin my night. However, I always am present for Cisco Catalyst updates. The failure scenarios are too many, and my recovery options too few. This past Friday I was doing a simple update, from 15.1 to 15.2.4(E6) on a pair of non-stacked Catalyst 2960X’s. I’d done two previous updates on this environment without issue, and after my onsite maintenance windows had been delayed a few times, I had to just schedule it to be done remotely. What could go wrong? I backed up all my configurations and downloaded the latest Cisco-recommended software on my switch, set it to /overwrite and /reload. I watched the upgrade status proceeding normally, remembering that there is often a long period where the switch is unresponsive due to console display errors during upgrades. Then I saw it start to reboot. And I waited. After 20 minutes my remote session didn’t come back up. I connected to the VPN and found that I could ping and ssh to the switch, but couldn’t ping any connected network devices. Logging in to the switch and running terminal monitor I started looking for what the problem could be. show ver shows me that the upgrade was successful. I can ping other switches and servers from inside this switch. So what’s wrong? You can try a reload but this won’t work. You can try a downgrade back to the previous version, but I don’t know if this will work (let me know if it does). Seemed too risky to me, and I’ve never done it, hope to try it in the lab if I can recreate the issue. In my case I had to call a coworker who lives nearby to go onsite and power the switch down. Sorry if you read this far hoping for a quick solution to this problem. Time to call your datacenter smart hands, or lace up your boots and head onsite yourself. If you are lucky, you are onsite already, laptop balanced on top of the KVM, reading this post, in which case you are very lucky! Just unplug the switch for 5 minutes, do some stretches, plug it back in, and all will be well again. My hosts should be balanced between switches. Fix that next time I’m onsite. This outage wouldn’t have required repair at 11pm on a Friday if the host had just failed over to the other switch. UPS should have had a network card in it. Not sure I would have done it in this scenario, but in some cases it would be helpful to be able to reset one of the power banks in the UPS using telnet from inside the failed switch. In this case there was no management card in the switch, and I would rather not risk a dirty shutdown of Exchange. But had I been prepared for this, I could arrange servers and switches accordingly into each of the APC’s power banks to minimize unsafe shutdowns while still allowing remote reboots. Gang Gang Dance are back after a long break following the release of Eye Contact, one of my favorite albums of 2011 and still in regular rotation for me. I haven’t been able to see them live since that year at a live show that blew me away. Their new record Kazuashita picks up where you’d hope they’d be after 7 years: shows growth, but dials the intensity back and feels to me a little more introspective and serious. From the first few mourning lines on album opener J-TREE (“I’m not ready / I’m not ready to go”) set to familiar pulsing rhythms, the vocal samples and chanting evolved to clips of protestors at the Dakota Pipeline, moving the listener from soaring Dakota plains and beyond into outer space.. man. 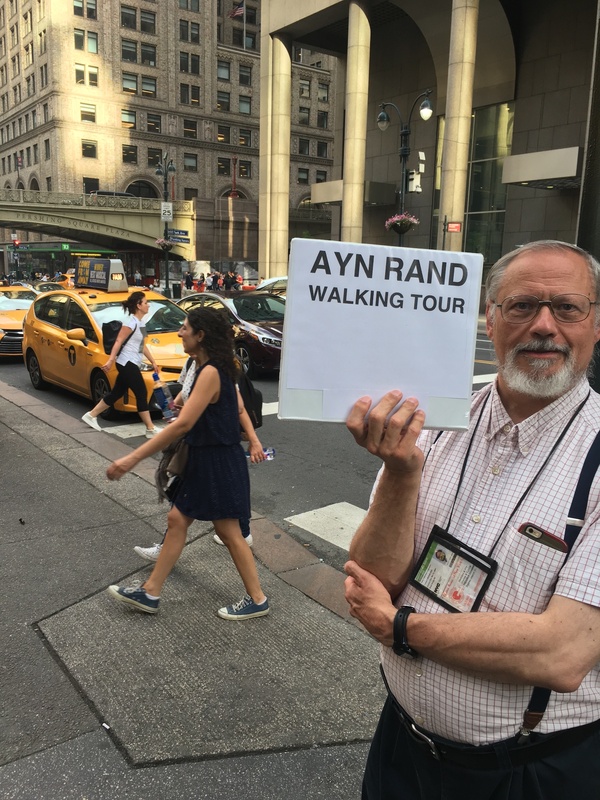 Maybe the Ayn Rand Walking Tour is a Looney Tunes-style trick, into the side of a wall painted to look like a tunnel, or over the edge of a cliff. While upgrading the software from 12 to 15 last week on a Catalyst 2960-X over TFTP, I noticed that the upgrade hung at “Extracting” for a very long time. I had just finished a similar update on a 2960S that was a few years older and did not notice a similar delay. 5 minutes passed and I started to get nervous. 10 minutes later I started Googling to see if this is normal. I didn’t find anything and wondered if something had gone wrong. Old image will be deleted before download. So I was very nervous that any attempt to kick this thing back into action would leave me with no image on the switch. It’s 9pm on Friday night and I’d like to go home! After about 15 minutes of waiting, the rest of the process finally kicked back into action and showed this message on screen. Would have been helpful if it had come up when it was actually relevant! Warning: Unable to allocate memory to display the tar extraction of files, however upgrade process is still continuing. If you would like to see the tar extraction output, try upgrading one switch at a time. In conclusion: don’t sweat it! It is normal for the Catalyst upgrade process to hang at Extracting. I do have patience for these things but when we look at the previous job for DC2, we can see that this task finished in a reported 9 seconds and the job completed shortly thereafter. Anxiously I review the logs in C:\ProgramData\Application Data\Veeam\Backup\<Job_Name> and confirm that there have been no additions to the log since this last entry. 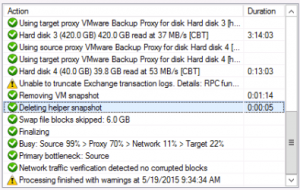 Next I review disk usage graph in VSphere console and verify that there is no I/O intensive operation occurring. There is nothing to see here. Success! Strange that it says it only took 5 seconds when it really took 2 hours. To compare results, I looked at the log file for the job which says it took 9 seconds, and see this in the logs. Look at the discrepancy between the highlighted lines. [19.05.2015 01:03:08] <44> Info [AP] (0339) output: –asyncNtf:Received external stop signal. [19.05.2015 01:35:55] <12> Info [Soap] Outgoing connection ‘client01vcenter:443:DOMAIN\itadmin:False::0:12’. [19.05.2015 01:35:55] <12> Info [Soap] Connection ‘client01vcenter:443:DOMAIN\itadmin:False::0:12’ is provided from the cache. [19.05.2015 01:35:55] <12> Info [Soap] Connection ‘client01vcenter:443:DOMAIN\itadmin:False::0:12’ is disposing. So, don’t worry if you are hanging at “deleting helper snapshot” in Veeam. There will be no progress on the screen and I don’t see any way to measure the progress. Relax, don’t stare at it, don’t cancel the job. There should be no impact because of this. I had no dropped pings to my server and had no I/O lockup as when deleting other snapshots.